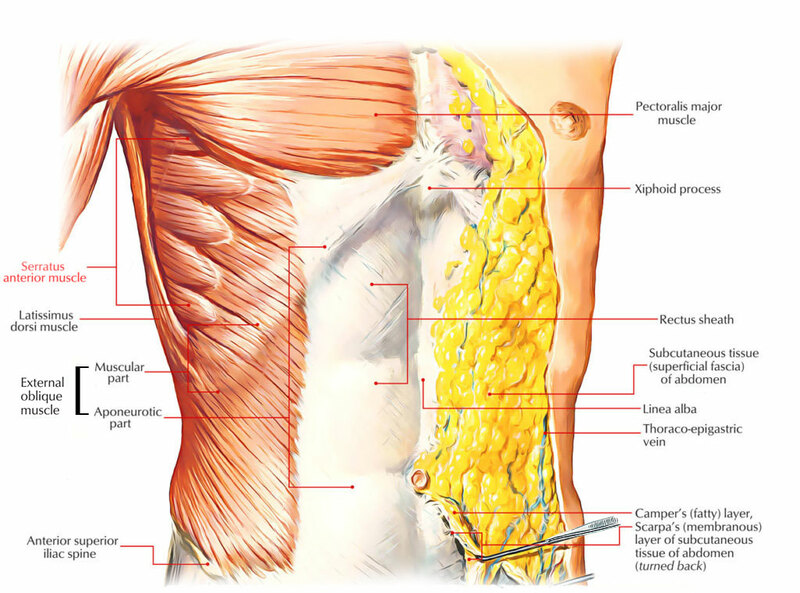 The serratus anterior is a wide sheet of muscle that envelops the side wall of the thorax. Therefore, it is not a muscle of the pectoral area. But for benefit, it is explained with the muscles of pectoral area. It emerges by a series of 8 digitations from upper eight ribs. The first digitation emerges from the 1st and 2nd ribs, whereas all other digitations emerge from their matching ribs. It emerges at a line of small triangular locations on the outer sides and superior borders of the first eight or nine ribs and the aponeuroses covering the intervening intercostal muscles. The serratus anterior is a large quadrilateral muscle which encloses the curved form of the chest. It is divided into finger like digitations, each emerging from an area on the side and upper border of a rib and the intercostal space above. The muscle can be partitioned into upper and lower portions. The upper portion is partly located against the upper side of the chest closely towards the underarm and partly situated in the middle of the scapula and chest. The lower portion which develops a thick, fan-shaped mass radiating forward from the inferior angle of the scapula includes five or 6 pointed digitations. Just the lowest three or four of these digitations can be seen their anterior half is superficial on the side of the chest, where they interdigitate with the packages of the external oblique, however they pass deep towards the latissimus dorsi as they head towards the inferior angle of the scapula. Nevertheless, the kind of the lower portion stays noticeable under the thin latissimus. The uppermost noticeable digitation begins at or simply above the level of the inferior border of the pectoralis major. The digitations practically reaching the front of the chest can start rather forward on the side of the chest. At narrow stripe on the costal (deep) side of the scapula at its vertebral border, which broadens in location at the inferior angle of the scapula. It is placed into the costal side of the scapula with its medial border. The first 2 digitations are placed into the superior angle, next 2 digitations into the medial border and the lower 4 or 5 digitations into the inferior angle of the scapula. It is a powerful protractor of the scapula, i.e., it pulls the scapula forward around the chest wall for pressing and punching movements as needed during boxing. Thus, serratus anterior is likewise called boxer’s muscle. It keeps the medial/vertebral border of scapula in firm contact with the chest wall. Its lower 4 or 5 digitations alongside lower part of the trapezius turn the scapula laterally and upwards throughout overhead abduction of the arm. Protraction of scapula is weakened. Inferior angle and medial border of scapula end up being unduly protuberant especially when patient presses his hands against the wall, creating a clinical disorder called winging of the scapula.